from designer soirée: "DESIGNER SOIREE brings high fashion to ready-to-wear in Manila with its much anticipated sample sale! 50-80% off on designer labels! New Brands: MISSONI, YOHJI YAMAMOTO, TIBI, TARA JARMON, PHILLIP LIM, ANDREW GN, and more! Plus original NY MoMA exclusives by TORD BOONTJE and GET HAPPY/LUCY IN THE SKY accessories! When? July 22 (sat) 12:30pm - 4:30pm; July 23 (sun) 1pm - 5pm. Where? 3/F Hall B, One Roxas Triangle, Paseo de Roxas, Makati (beside Mandarin Hotel). RSVP 0917-8385158. Cash only for new clients. Shop leisurely and enjoy afternoon tea amidst the company of your friends." from itsie-bitsie: " here's another reason for you to come to itsie-bitsie! starting july 20, our annual shoe sale will be in full swing! all footwear going for as much as 70% off! take advantage of our on-going merchandise clearance events on its last two weeks, everything in the store at extremely discounted prices. surprises await you at itsie-bitsie! mon-sat, 10am-9pm; sundays, 11am-7pm." from chic magnet: "hi! come and grab chic magnet bags, which are now on sale at ilaya, power plant mall; schu, glorietta 3; and ruth & esther, city golf plaza. all your fave chic magnet bags at further reduced prices... until supplies last ;-)"
from paul smith: "41 on sale begins july 7, friday to july 16, sunday at #41 sta. maria st., barangay kapitolyo, pasig city. 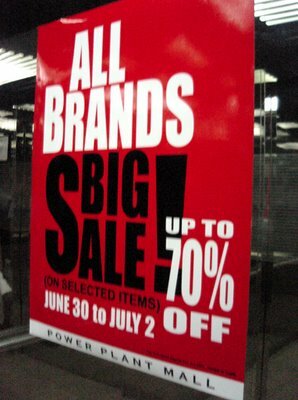 shopping hours are 12nn-7pm, monday to friday; 12nn-6pm, saturday and sunday. cash basis only. see you there!" from microwarehouse: "microwarehouse mid-year inventory sale! up to 80% off! on selected items from belkin, covertec, ipaq, palm, ipod and apple. july 6-7, 9am-6pm. july 8, 9am-12nn. 4 united street, barangay kapitolyo, pasig city, tel 637-0474 to 85." from rustan's: "come to rustan's shangri-la plaza for our ladies sale, from 30-70% off! brands like vivienne tam, BCBG, diane von furstenberg, sinéquanone, j.lo, le sport sac, baby phat, FCUK, bond eye, tiger lily, aerosoles, liz claiborne, etc. there just too many to mention! it starts june 30!" from aranaz: "aranaz on sale!! this weekend at the power plant mall only! up to 50% off! also check out our export overruns." from paul smith: "our spring/summer sale is on. glorietta 4 and shangri-la plaza. good day!" from rustan's: "hope y'all been saving because the DVF, BCBG, anna sui and betsey johnson end-of-season sale begins this friday, june 30 only at rustan's tower, shangri-la plaza. vivienne tam end-of-season sale on-going at both rustan's makati and shangri-la plaza." from zara: "spring/summer has come to its glorious end. but zara is extending it with a bang! we invite you to our end-of-season sale starting june 30. hurry to where summer's still hot! zara, glorietta 3 and power plant mall." From Barney's Girl's blog: It appears that this Spanish brand Zara is so fashion forward that while it takes everyone else who manufactures in Asia 6-9 months to get a new design into the shops, it only takes Zara around 5 weeks to do so! Around half of their clothing is manufactured in-house at its base in La Coruna in north-west Spain or by smaller businesses in the same area. The clothing are then delivered by truck to Europe and by air to the rest of the world. In addition, Zara avoids mass production, which helps to keep the store looking fresh, create a scarcity value so we'd buy it now before it runs out tomorrow and to reduce markdowns. The number of marked down items that end up in sale is only about half the industry average.